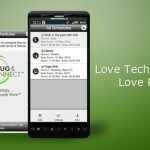 Unplug and Reconnect is introducing a new app for the Android that uses technology to schedule a break from technology. It “silences” your phone for a predetermined period and lets your friends know that you are temporarily unplugging from the virtual or technical world and reconnecting with real life. Once unplugging time is over, the app restores your phone to its prior settings. “The new Unplug and Reconnect app, like no other app available on the Android market, makes it easy to schedule a ‘phone vacation’ or an unplugging and reconnecting event anytime you want,” said Dr. Joseph Geliebter, founder and CEO of Unplug and Reconnect, an organization dedicated to educating people about the importance of unplugging from technology and reconnecting with the people and events that are meaningful to them. Schedule unplugging time in advance. At the scheduled time, your smartphone will switch to silent, vibrate, call reject or airplane mode, depending on your selection. Generate an automatic text message when the phone is in “call reject” mode – such as “I’m taking ‘me’ time” – so anyone calling your phone will know you’re taking a break from technology. Automatically post status updates to Facebook and Twitter, should you choose to tell your friends how you’re spending your unplugging time and the duration of the break. Stop worrying about forgetting to reset your phone to ring mode after unplugging time is over – the new app automatically does it for you. Get instant reminders of upcoming breaks from technology that you have scheduled. Feedback from test users indicates that several innovative features make the new app especially useful. Testers particularly liked the app feature that restores phone alert settings once an unplugging session has ended. The app is available in the Android Marketplace.